Burger King became Burger Queen for one day only in honour of Her Majesty Queen Elizabeth’s 90th birthday celebrations on April 21st. The royally refurbished outlet in London’s Tottenham Court Road also offered customers a special app from which they could claim a Chicken Royale and small fries for a whopping £1.99 (Bargain! Thank you Queenie!). 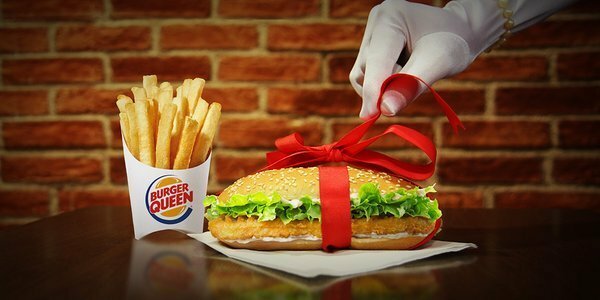 Simon Joseph, regional managing director at Burger King, said, “At Burger King we wanted to celebrate this exciting event, and what better way than with our very own royal makeover transforming the king of the burger into a Burger Queen. We hope our Tottenham Court Road guests enjoy this tribute to Queen Elizabeth II. We congratulate her majesty on her birthday”. Thousands of people around the world took to Twitter to mark the special occasion, using hashtags #HappyBirthdayYourMajesty and #Queenat90. The Evian babies have returned to our screens in a new ad that focuses on the brand’s core message – youth. The ‘Baby Bay’ film shows a surfer who finds himself surrounded by little surfers on the beach who serve up some Evian at the local beach bar shack. The ad continues to push the “Live Young” tagline as seen in previous films starring the brand’s famous babies. The campaign includes a virtual reality mobile app in partnership with Quicksilver that provides users with a fun 360-degree wave riding experience. The immersive experience allows consumers to put themselves in the wetsuit of a baby before performing a selection of iconic surfing moves. In North America the campaign has partnered with current model it-girl, Gigi Hadid, for its outdoor ads. 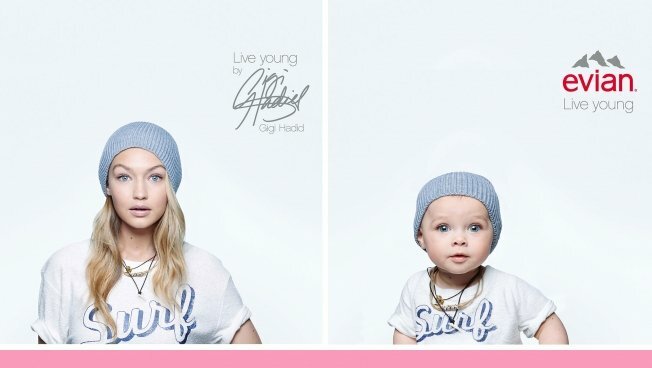 Gigi stars alongside her surfing-baby lookalike, with her ads being predominately displayed in the New York, Los Angeles and Toronto markets. The campaign will also involve social media activity, print media and a set of collector’s items. YouTube has launched a feature allowing filmmakers to livestream 360-degree clips alongside 360-degree sound and has been designed to be used with virtual reality headsets. 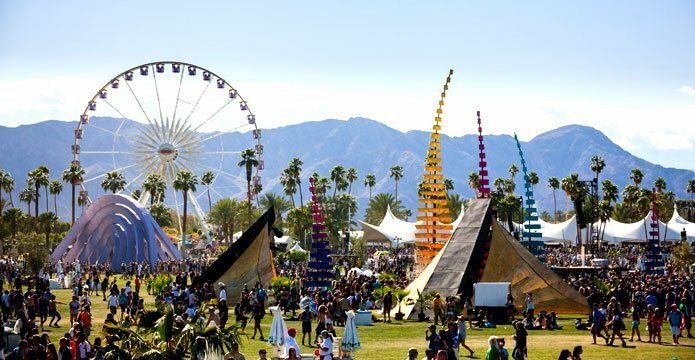 The Coachella music festival was the first major event to make use of the new feature. The event takes place over two consecutive weekends in the Californian desert and attracts around 200,000 people every year. This year, Youtube were able to livestream performances from some of the world’s biggest artists, including Calvin Harris, Guns N Roses and LCD Soundsystem, for fans who could enjoy from the comfort of their own home. The format allows PC users to manipulate their viewpoint by moving their mouse, however, if used with a virtual reality headset, users were able to ‘look around’ the festival ground by moving their head, making it a far more immersive experience. The technology was developed in collaboration with Two Big Ears and VideoStitch. Google have also introduced a ‘spatial audio’ feature that distinguishes between sounds coming from different directions – helping to make the festival experience seem even more real! 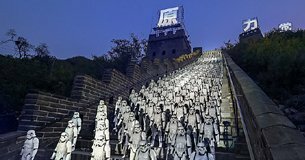 The Great Wall of China, afternoon naps, Star Wars and bin bags. 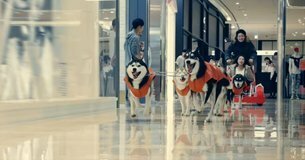 #RedCups, sled dogs and 90-foot selfie sticks. 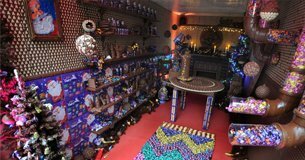 A real life Cadbury advent calendar, Jaguar's "Actual Reality" prank and starring alongside Naomi Campbell in Burberry's Christmas ad.